When golfing is shut down in most parts of the USA due to seasonal restrictions, golfing in Palm Springs comes to life. If you are looking for exciting La Quinta golf deals, you should make sure you check out the Stadium Golf Course at PGA WEST. This course is annually ranked as one of the top 100 courses in America as well as one of the top 50 most difficult. La Quinta, Ca. is located just outside of the famous Palm Springs area. This course was designed by the popular Pete Dye and was opened in 1986. The 18 hole course is carded as a par 72, covering 7,300 yards from the championship (black) tees. The course carries rating of 75.8 with a slope of 148 on Bermuda grass. The real challenge on this course comes from it's treacherous design. The course is infiltrated by strategically placed lakes, massive sand traps in key landing areas, sloping fairways and fast greens. 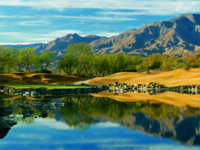 When looking for La Quinta tee times, be sure to inquire into Stadium Golf Course at PGA WEST discounts. Reservations may be made online or through the starter. Amenities include an extensive practice facility, Carts, club rental and terrific dining facilities. Players are in awe of the challenge this course offers in all aspects of the game. It's a truly great course.